Preston Family Chiropractic and Acupuncture – Page 6 – Cary's choice in Chiropractic and Acupuncture care for over 10 years! Neck Pain – Does Chiropractic Care Help? It’s common to have a stiff neck once in a while but when the neck pain doesn’t subside, something could be wrong. Chiropractic care has been used for many years to offer relief for neck pain. Sleeping in a good pillow and exercising regularly are good ways to prevent neck pain. However, if the pain is too much, chiropractic care can help. If you have a neck stiffness that doesn’t subside after a few days, a chiropractor can help. Severe neck pain can make it difficult to move your neck or force you to rely on over the counter medication. Sometimes the neck pain causes numbness or tingling in your hands. There are people who suffer from neck pain after being involved in an accident. During the first exam, the chiropractor will ask you a series of questions in order to try and determine the cause of your neck pain. You’ll need to answer questions about your symptoms, the history of the pain as well as the types of movement that you are unable to make. A physical examination will also be done to identify any swelling or tenderness on the neck and arms. Going through this first session is always important because it helps the chiropractor to determine the most appropriate treatment. When you have a poor posture or you stick your neck in an awkward position for a long time without moving it, you may suffer from serious neck pain. What happens is that the vertebrae which make up the neck shifts out of alignment? This shift of the vertebrae pinches the nerves in between the vertebra causing pain and discomfort. Spinal adjustments can be done to align the vertebrae. An injury to the neck commonly known as whiplash can also lead to pain. It causes the tendons and ligaments in your neck to move or overstretch. Neck pain can be prevented by maintaining a good posture. If you use your computer often, move it to eye level so you don’t have to strain your neck. Sleeping in a firm pillow can help prevent neck pain. One major cause of neck pain is stress so you need to learn how to prevent and relieve stress of everyday life. Exercising your neck regularly throughout the day can help to prevent stiffness and pain. At Preston Chiropractic and Acupuncture, we put your Cary chiropractic care first! Call us and schedule an appointment with us. Author prestonfamilychiropracticPosted on April 30, 2016 Leave a comment on Neck Pain – Does Chiropractic Care Help? You have probably seen it in the movies or heard about from a friend. Acupuncture treatment has become a widely accepted form of treatment in the western world although it originated from the Far East. This branch of traditional Chinese medicine has been tried and tested after thousands of years of practice in china. After the fame of its health benefits spread across the world, more medical professionals are open to learning and even recommending this procedure to their patients. Many people often find themselves in the perpetual state of sympathetic dominance. The kind of lifestyle many people lead today puts them in very stressful situations almost every day. Health is as much in the mind as it is in the body. When you are stressed it is much easier to fall sick than when you are not. Acupuncture can help manage stress levels in the body and equally promote good health. Acupuncture corrects imbalances in the energy flow of the body. This leads to an extremely relaxing state during the treatment. After an acupuncture session, you will experience more energy than you have in recent times. You will have more motivation to do work, exercise and generally living a more fulfilling life. There are different acupuncture points that correspond to various body organs. Acupuncture treatment can help to improve bowel function relieving illnesses such as IBS, improve digestion, liver, heart and other vital organ function. Finally, acupuncture is very effective in controlling acute and chronic pain conditions. People with illnesses such as arthritis, back pain, sport injuries, post surgery scars and cancer can benefit from the pain relieving effects of acupuncture treatment. The insertion of acupuncture needles on the skin surface is a carefully calculated process. You should only get treatment from a licensed professional with enough experience in this kind of treatment for the best results. 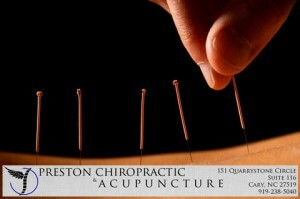 Acupuncture occupies a central place in our chiropractic practice. 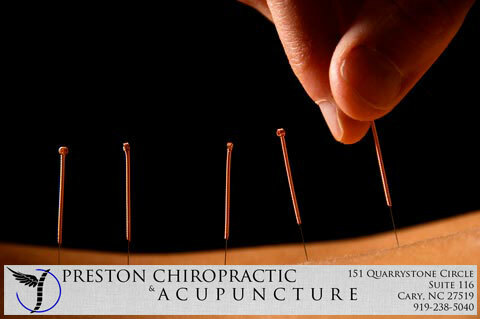 Call us here at Preston Chiropractic & Acupuncture to book a wonderful and life-changing acupuncture session. If you’ve never considered chiropractic care in Cary NC, perhaps it’s time you did. Chiropractic adjustments can be used to deal with common issues like back pain, headaches, blood pressure and asthma. However, this practice is surrounded by lots of misconceptions. We’ll review some truths about chiropractic care. Chiropractic care involves using natural treatment methods that don’t involve drugs to address common conditions. Chiropractors have helped patients achieve their goals by performing certain adjustments. They believe that the body has the ability to heal itself rather than depend on drugs all the time. These professionals focus on the nervous system as well as the health of your spine. They believe that by making sure your spine is properly aligned, you can address numerous health challenges without the use of drugs. Chiropractors in Cary NC use different spinal adjustments to get rid of issues like lower back pain and migraines. Conditions like migraines that cause pain shouldn’t always be treated by taking medication. The effectiveness of chiropractic care in treating neck and back pain was studied and published in a British Medical Journal in 2003. During the study, 83 patients who suffered from neck pain were given manual therapy together with other forms of treatment like physiotherapy and counselling for 52 weeks. The results of the clinical study showed that chiropractic care had a faster recovery process compared to general practitioner care as well as treatments like physiotherapy. The study also revealed that the cost of chiropractic adjustments was much lower. An individual could spend a third of the cost a month on chiropractic care compared to physiotherapy and general treatment. Almost 56% of the individuals reported an improvement in symptoms of back pain. This combined with other studies have shown chiropractic care to be effective in dealing with different forms of pain. Should you participate in chiropractic treatment? It’s always important to consult your doctor before you begin any chiropractic manipulations. This is especially crucial if you suffer from a condition like severe back pain. Chiropractic care may interact with some medications and supplements. Chiropractic care is also not recommended for patients who suffer from osteoporosis, nerve damage and loss of strength in the leg or arm. If you are a spinal surgery patient, make sure you get the advice of your doctor before seeking this form of treatment. Pregnant mothers are also advised on consulting their doctor prior to seeking treatment. 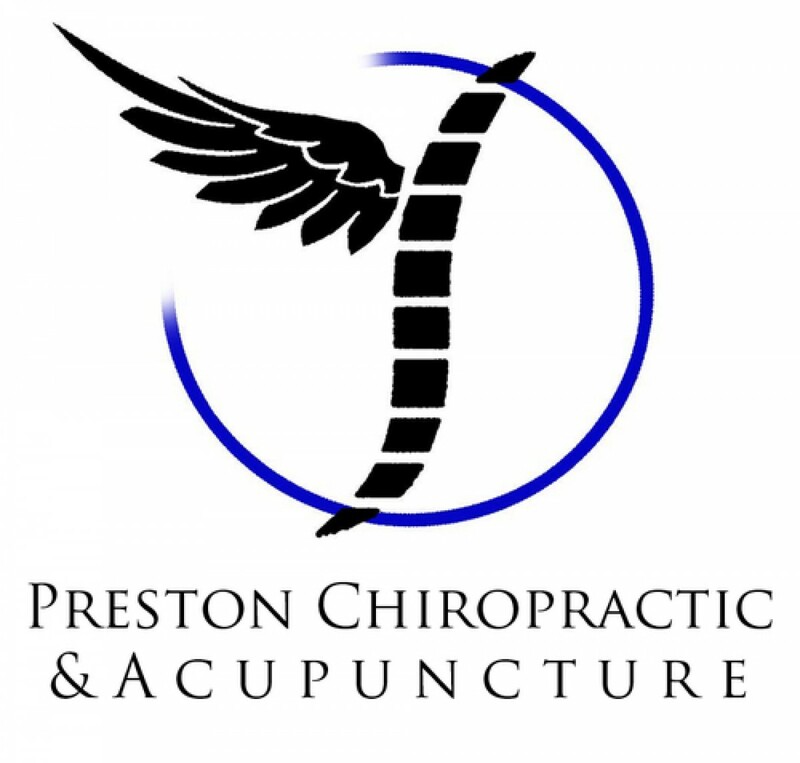 Preston Chiropractic & Acupuncture has been providing great chiropractor adjustments, back pain relief, accident injury treatments, acupuncture, and medical massage therapy for more than 12 years. Contact us to book your appointment! Last week we explored two of the most important action steps in healing an injury – resting the affected area, and applying ice to the affected area. These two basics have survived the test of time and still hold as the best immediate response to an acute physical trauma. What happens though when rest and ice don’t completely finish the job, or aren’t enough to get an athlete back into their sport fast enough? Sure the body has its own innate healing capacity, every living creature does. What are some other options? Options that once used to treat a current injury can also be used to prevent a future one? Acupuncture, chiropractic, physical therapy, and massage are all relied upon equally by people who used their bodies to make a living as well as recreation athletes. Often times though, people aren’t sure which healing modality is appropriate for their particular type of injury. Today we are going to explore each one and when each can be used most successfully. Acupuncture is but one part of the complete medical system that is Traditional Chinese Medicine and involves inserting hair-thin needles in predetermined points on the body to elicit a neurological and/or hormonal response to facilitate healing. Acupuncture has been used effectively for centuries to treat all manner of internal medical issues ranging from menstrual irregularities, menopausal regulation, infertility, and in the West for its better-known effect on pain and injury.